I've wanted to try my hand at some fur for a while, so I decided I'd attempt a wolf for Emily, since she's such a fan. He's about 6 x 7, Prismacolors on white Stonehenge paper, and I was pleased with the way he turned out. Wow, that's beautiful Sherry! 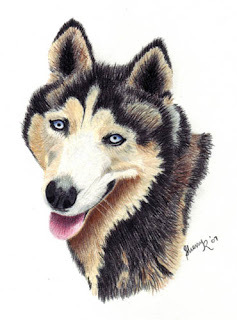 We used to have a siberian husky (named Shondi) who looked just like that -- only she had one blue eye and one brown eye. Fantastic job. Great job on the fur, and the whole picture. Nice work. That is one great piece of artwork, Sherry. I'm so impressed with how realistic is looks. I love it! A spot to share my colored pencil endeavours with family and friends. I'm an absolute beginner but I really love this medium, and providing my brain with an artistic outlet as well as the literary one. I'm a speculative fiction writer from Nova Scotia, Canada, and just a hobbyist at colored pencil. But I find it a relaxing and enjoyable art form. And I think I'm improving! Start from the beginning of the archives and work your way up to see the pictures in chronological order. This year I'm attempting to do an Illustration Friday picture every week. All my IF creations are now viewable as a set at flickr.com. Illustration Friday - "Your Paradise"
All images on this site are copyright Sherry D. Ramsey and may not be reproduced or used in any way except with the express written permission of the artist.